Crock Pot Vegetable Lasagna is stacked a “mile high” with vegetables, 3 cheeses and whole wheat noodles. Just layer everything in your slow cooker and then sit back and wait for the applause. 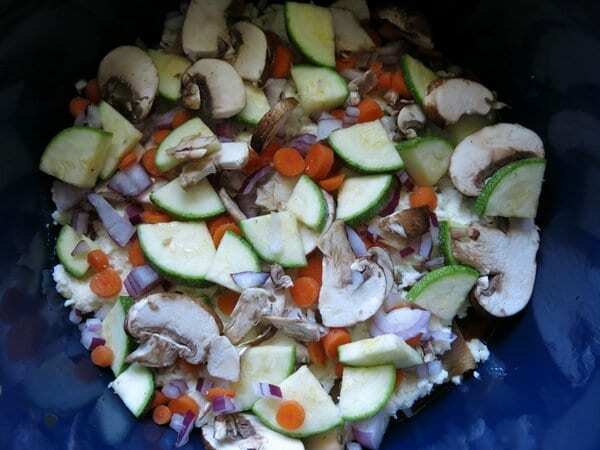 It’s hard to believe that there are 6 cups of vegetables piled high in this Crock Pot Vegetable Lasagna. You can see the carrot peeking out between the cheesy layers. What you can’t see are the slices of zucchini, mushroom and red onion. They are smothered in a creamy ricotta and mozzarella cheese mixture and a generous portion of pasta sauce. This recipe is a personal favorite of mine. Sit me down with a serving and I’m a happy camper. It’s a satisfying one dish meal. And, there are usually leftovers. I individually wrap single servings and freeze them for days when I need a quick dinner or lunch. In case you’re new to the pasta in the crock pot technique, here are some tips and pics. Buy regular lasagna noodles (not the no-boil kind.) Either way, the noodles are not boiled first. Whole wheat noodles are pictured. Spreading the cheesy layer over the broken noodles can be tricky. Drop small scoops of the cheese mixture over the noodles. (I use a 1 Tablespoon cookie scoop to this.) Use a spoon (or your fingertips) to gently spread the piles of cheese over the noodles. Layer the vegetables over the cheese and then top with a generous portion of pasta sauce. Keep layering…there will be 3 layers of vegetables and 4 layers of noodles. I know. It’s a lot! I used a 5 1/2 quart slow cooker. If you have a large crock pot, you could spread everything over 3 layers of noodles instead. Set the crock pot on low and let the magic begin. The cheese and sauce softens the noodles and the veges become tender and soft. A “mile high” vegetable lasagna…that will not disappoint! 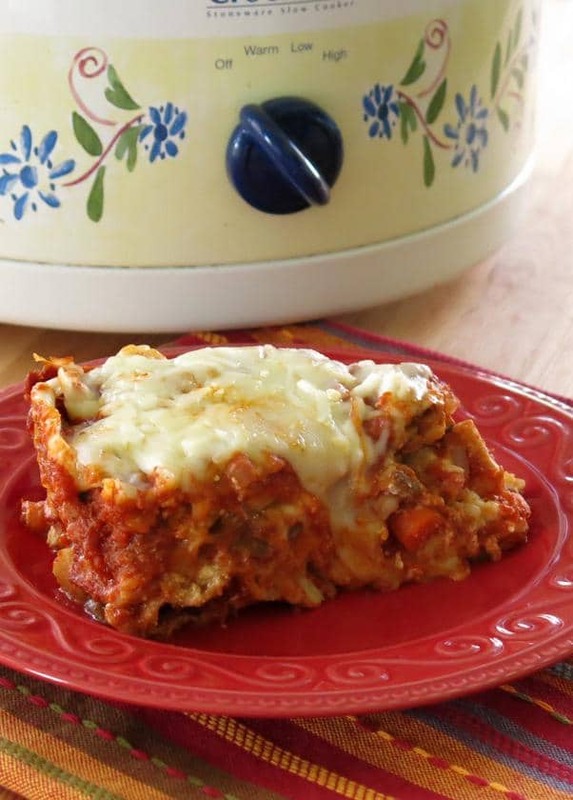 Crock Pot Vegetable Lasagna stacks vegetables, 3 cheeses and noodles a mile high. Layer everything in your slow cooker and then sit back and relax. 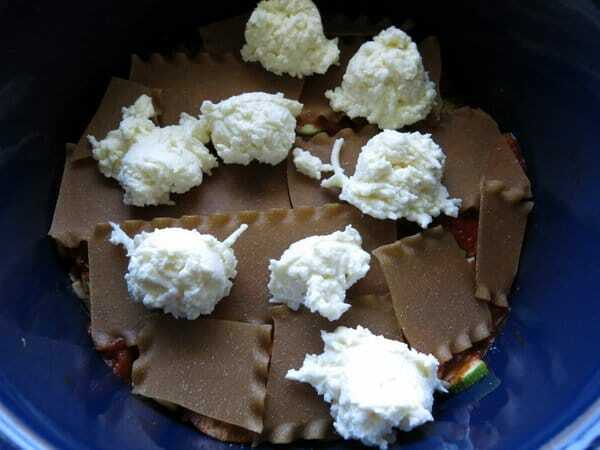 Combine ricotta, 2 cups of mozzarella cheese, egg and garlic in a bowl and set aside. Generously coat the inside of the crock pot with cooking spray. Spread 1/2 cup of pasta sauce over the bottom of the crock pot. Layer 3 lasagna noodles in the bottom of the crock pot, breaking noodles as necessary and overlapping pieces to cover the pasta sauce. Don't worry how it looks! Layer a third of the vegetable mixture (about 1 1/2 cups) over cheese mixture. Spread 3/4 cup of pasta sauce over the vegetables. Top with 3 more lasagna noodles and remaining pasta sauce. Cook on low heat for 4 hours. Remove lid and sprinkle 2 cups of mozzarella cheese and 1/4 cup of Parmesan cheese over the top. Replace lid and allow to sit for about 30 minutes so cheese will melt and lasagna will set. Switch out the vegetables if you don't like one! This looks so delicious and convenient – never tried a pasta dish in the crockpot before but I think it’s high time! I have not tried pasta in the crockpot before so I definitely appreciate the tips! Love vegetable lasagna! I have yet to make a lasagna in the slow cooker. I have to remedy that. Your looks so good. 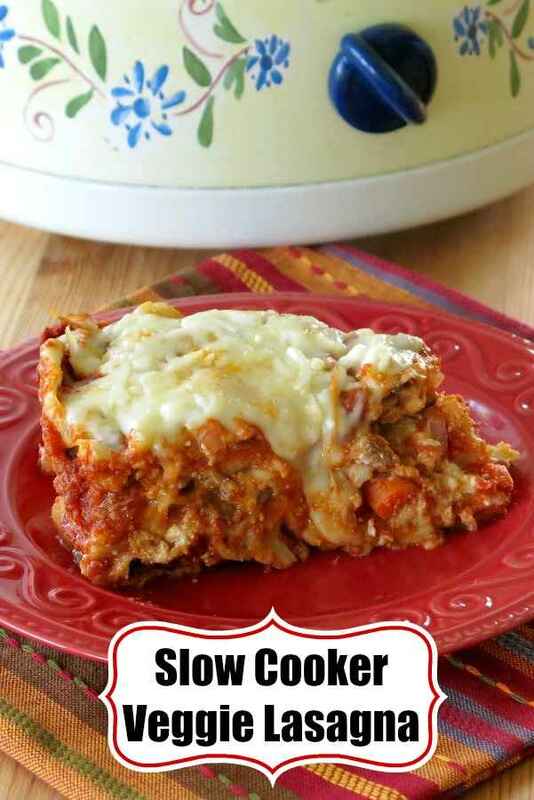 I haven’t ever tried lasagna in a slow cooker! 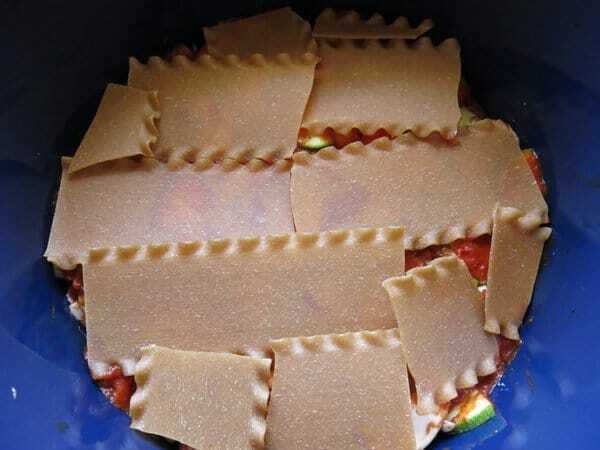 Wow that looks like a super hearty lasagna. I have been wanting someone to tell me how to do this so thank you so much! HOLY MOLY!! This is incredible. Is it terrible to admit that I am having ‘crock-pot envy’ right now? I have to start using mine and this recipe is going to be next on the list! Thanks so much for the wonderful step-by-step pictures! 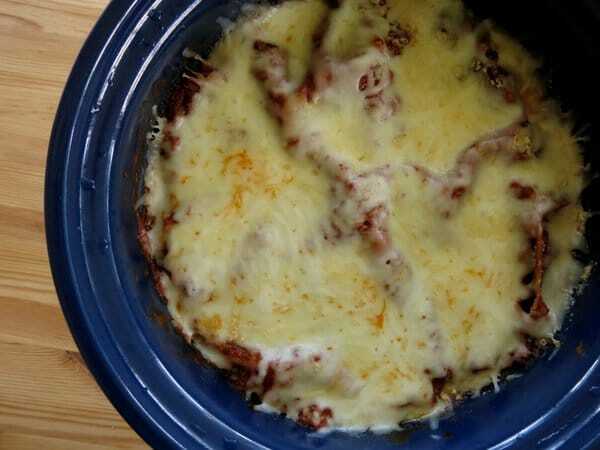 This crock pot lasagne looks so scrumptious. I wish I had a slice now. 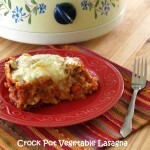 Wow, this looks delicious- I had no idea you could make lasagna in a crockpot- Genius! 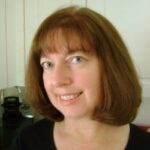 I never attempted a lasagna in a crock pot – I need to change that ASAP! Looks divine! Lasagna in the crockpot? how clever is that! Just found your blog through the LeanGreenBean and I think I’m going to camp out here and stay a while! Love this recipe and all the crockpot recipes you have featured here! Once the leaves start changing my cockpot has a permanent place on my counter. Love crockpot meals for fall and this is one I’ll be trying very soon!